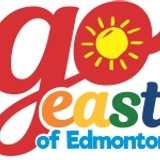 As the eastern gateway to the Go East of Edmonton Tourism Region, Lloydminster is a thriving retail centre with something for everyone. Across Lloydminster you will find over 10 great choices for hotels, all close to dining and shopping outlets. See the Accommodation Guide on page 34. 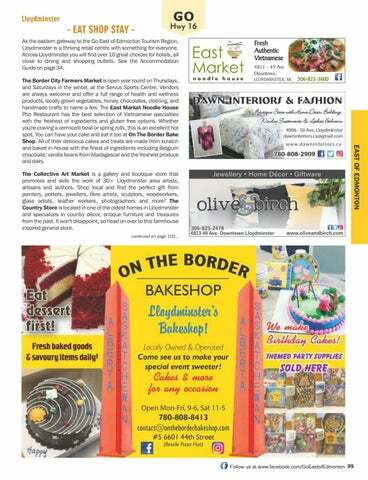 The Border City Farmers Market is open year round on Thursdays, and Saturdays in the winter, at the Servus Sports Centre. Vendors are always welcome and offer a full range of health and wellness products, locally grown vegetables, honey, chocolates, clothing, and handmade crafts to name a few. The East Market Noodle House Pho Restaurant has the best selection of Vietnamese specialties with the freshest of ingredients and gluten free options. Whether you're craving a vermicelli bowl or spring rolls, this is an excellent hot spot. You can have your cake and eat it too at On The Border Bake Shop. All of their delicious cakes and treats are made from scratch and baked in-house with the finest of ingredients including Belgium chocolate, vanilla beans from Madagascar and the freshest produce and dairy.